As I introduced to you all back in November, there are big changes occurring in my life. Since I last blogged, I have officially interviewed and been accepted for EDGE Corps with The Navigators at the University of Nebraska – Kearney, and I have begun training and raising support. The EDGE Corps is a 1-2 year opportunity to be trained in ministry while reaching out with the love of Christ to college students who are spiritually hungry. I am currently in the middle of raising ministry support for this first year of EDGE. Those of you who are familiar with The Navigators are already aware that all EDGE Corps staff are supported entirely by gifts from friends, family and local churches. In order to serve on campus, I am trusting God with my first ministry assignment, which is to put together a team of partners who will give financially from $50-$250 per month and a few who can give more. This means that I am reaching out to as many people as I can to meet with them and share what God has been doing in my life and what this next step is all about. If you read back through my blog posts the past couple years, it will be evident that God has been leading me in the direction of full-time ministry for awhile. Because He has called me to this, I am confident that He will provide this team of supporters for me. Romans 8:32 – He who did not spare his own Son but gave him up for us all, how will he not also with him graciously give us all things? Will you prayerfully consider joining my team? I do not want people to rush into a decision to support me or to have not been prompted by God to do so. I do not want people to feel obligated to support me or pressured to support me or to do it begrudgingly. 2 Corinthians 9:7 – Each one must give as he has decided in his heart, not reluctantly or under compulsion, for God loves a cheerful giver. I want a team of partners to give out of the overflow of their hearts. I also desire a team to come alongside me in prayer. It is so vital to know that those who are supporting me are also interceding for me at the throne of grace. There is a spiritual battle going on all around us, and I have never been more aware of that before now. I also use the word partner because that is exactly what I want this to be: a partnership. The ministry that I will be doing on campus could not be completed without the support of individuals. However, I also believe the partnership works the other direction as well. I want to be praying for those who support me. It is just as vital for them to receive prayer because they are the ones doing ministry in the workplace or in their homes by being a light for Christ. Their ministry is just as valued by God as my ministry among college students. A part of me feels like I may have just rambled a bit through all of that information, but I pray that some of it makes sense to you. I pray that you would understand with more clarity where I am coming from and what I am praying for in a ministry support team. Would you prayerfully consider joining my team? I am still in need of prayer and financial support, and I would love for you to prayerfully consider joining me. I have currently raised 44% of my budget for next year, and my goal is to be at 100% by May 1st in order to spend 2 months of this summer as a team leader and staff member at the JAX – Summer Training Program in Jacksonville, FL. If you have any questions or would like to meet with me to discuss what I will be doing in more detail, I would love to make arrangements to speak with you. (I am willing to travel!) Please comment below, or send me an email at nelsen.cr@gmail.com. Or if you have already prayerfully considered joining my team and feel as though God is leading you to do so, you can follow this link to my staff site to donate directly to my ministry. Thank you so much for taking the time to read this, to learn how God has been leading me, and to pray about how God may be leading you to support me. P.S. I plan on continuing to introduce you to what this ministry is all about through additional blog entries, but if you are interested in receiving a monthly newsletter from me during my time on EDGE Corps, follow this link to sign up! ¡Viva Argentina! – Finally here! Does anyone else’s washing machine or clothes dryer eat socks (only one of the pair of course)? Where do they go? The last sock I was missing was a hand knitted sock which caused me great sadness. The next time I did laundry I began to think – sometimes items get caught on a teeny, tiny nail at the bottom of our laundry shoot. Sure enough, I looked up with anticipation and there it was dangling, waiting to be rescued. My once lost sock was now reunited with it’s mate. I recently had another item missing which caused me even more distress than the loss of my sock. I had lost my SOCK knitting instruction book. I purchased this book back about 7 years ago when I started the hand knitting sock craze and I am constantly referring to it if not actually knitting a pair from one of it’s patterns. Oh so sad…really…really sad. I looked for it for over three months. I figured I must have left it in a hotel room, a coffee shop, maybe it fell out of my bag somewhere. The day I had decided to buy the book again, I was grabbing something off the bookshelf and there it was. Yes, I looked there before – more than once! I found it wedged between two 3-ring binders. Yay! The Lost is Found! I know there are several other Sock books out there but this one had all my notes, markings and comments. It’s like a well used cookbook except it is the patterns that are tried and tested and made multiple times. What have you been missing lately? Happy St. Patrick’s Day Grandma! Happy St. Patrick’s Day! In our family it’s “Happy Birthday Grandma.” You see she is a St. Patrick’s Day baby. She doesn’t seem to mind that her birthday falls on a holiday. I’ve always proudly told everyone – hey it’s my mom’s birthday (Grandma to my girls). We celebrated her birthday yesterday and had 16 of the 20 close family members present. It was a fun day! I Just Love KnitPicks! 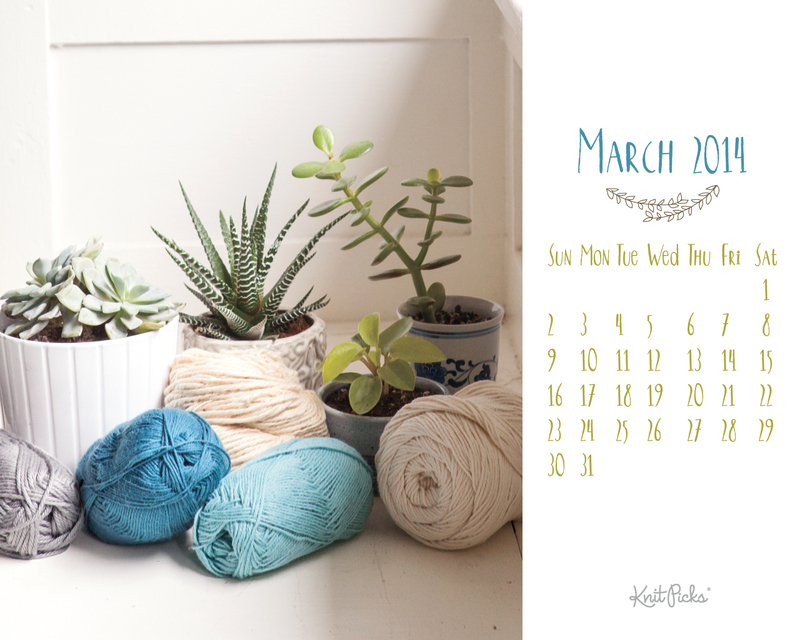 To help chase away those last few weeks of winter they are offering a free downloadable calendar background. Simply click the picture below and go to their website to download. How are your memory keeping endeavors going this far into the new year?